You only have to size up one number to realise why Mini has launched a five-door hatchback. 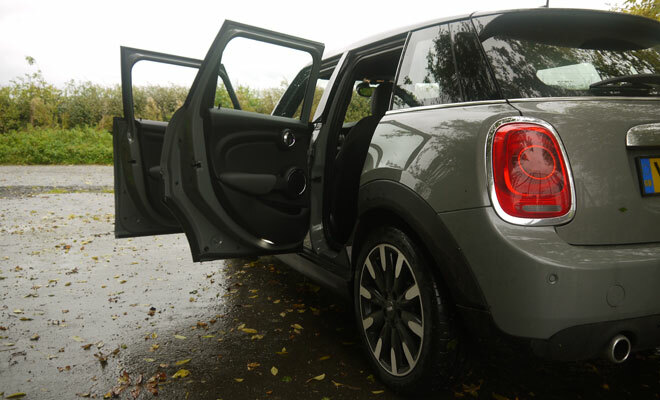 Around 70% of all small cars sold in the UK have five doors. Clinging to a three-door format is equivalent to pointing more than two thirds of potential customers in the direction of an Audi or Volkswagen dealership. Unlike an A1 or Polo, the new Mini has substantially changed its silhouette in the acquisition of its extra doors. The five-door is about 16cm longer than the three-door Mini hatchback. About 7cm of that stretch lies between the axles, while the rest has been added to the rear overhang. Measuring 3,982mm from bumper to bumper, the extended Mini is a fraction longer than a Ford Fiesta but noticeably shorter than a Renault Clio. Putting the Mini on the rack has not exactly improved its posture. If it were to grow a mouth and ask if it’s bum looked big you’d have to lie to spare its feelings. But at least you can now get more junk in the trunk – the boot has grown by 67 litres to 278 litres, a competitive figure for this size of car. A sloped rather than upright rear hatch has exacerbated the bulge of the five-door’s bottom, but does clearly differentiate it from the upcoming Clubman estate car. 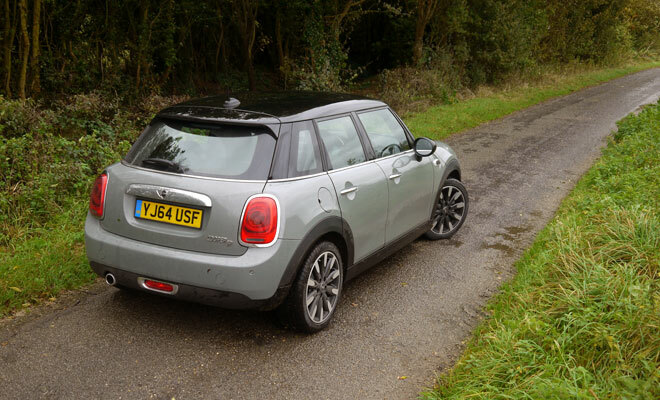 Unfortunately the Mini’s floating roof – a key styling feature – looks much less persuasive on the five-door body, with the clutter of so many black-painted pillars to spoil the illusion. With glued-on rear glass and frameless front doors, the three-door Mini hides most of its structural uprights behind flush glazing, creating the suggestion that a smooth ring of glass supports the roof. The five-door, by contrast, employs external window frames that are not so easily disguised. Still, at least the rear windows wind down all the way into the doors when you want fresh air. Inside, you’ll find some welcome room for legs in the back. The wheelbase of the five-door is a full 10cm longer than the last-generation hatchback, which would seem to be about the space needed by a human leg from shin to calf. Sitting in the back is now a reasonable prospect rather than a cruel and unusual punishment for adults, while kids on booster cushions may even be able to swing their feet a bit. And compared to the three-door car, strapping a child in place will no longer require the limber spine of a contortionist. The rear doors are not huge, but they open out to almost ninety degrees to provide adequate access. Adults can climb in without having to gather in their feet by hand. 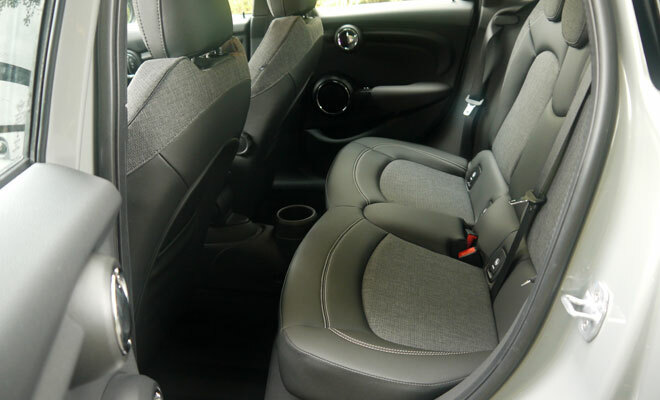 Up front, the cabin is a carbon copy of the new Mini in familiar three-door guise. That means a quirky and occasionally gimmicky approach to the design of instruments, buttons and switches, tempered with a welcome air of quality and solidity. 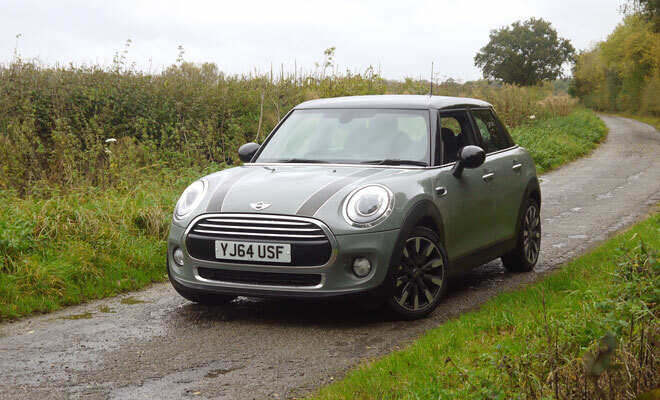 On the move, even on upgraded 17-inch wheels, the Cooper D model I tested seemed more settled and smoother riding than any other small Mini I’ve driven. All other things being equal, a longer car will always ride more easily over bumps. The same goes for a heavier car, and the five-door Mini weighs about 5% more than the three-door. It is still a Mini, however, which means a very firm and sporty ride compared to most competitors. If driving a Polo is like walking barefoot across a soft and springy lawn, the Mini is stamping across stripped and varnished floorboards. With the odd nail poking out to wake you up. The flipside of discomfort is flat, composed cornering, which will hopefully be important to you if you buy a Mini and add big wheels with skinny tyres. And if there’s any more body roll than in the three-door (which barely leans over at all), I didn’t notice it. 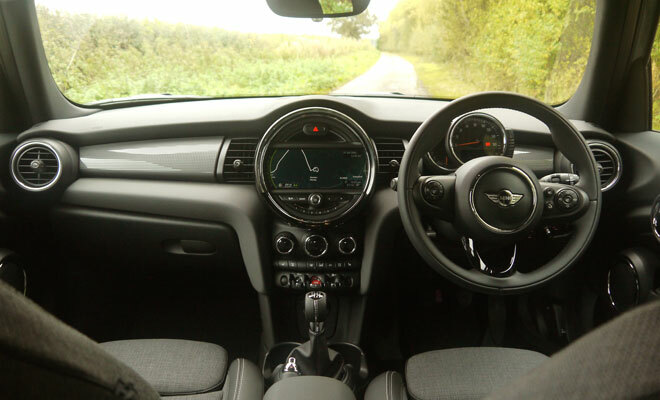 As with the standard Mini hatch, the steering feels quick, hefty and direct. Twisting the base of the gear surround will flip you into Sport mode, which makes the steering no more direct but heavier and much less natural in feel. The accelerator also becomes positively hyperactive and thus harder to modulate accurately. I prefer the helm and throttle in their standard “Mid” mode and thankfully that’s how the car wakes up. 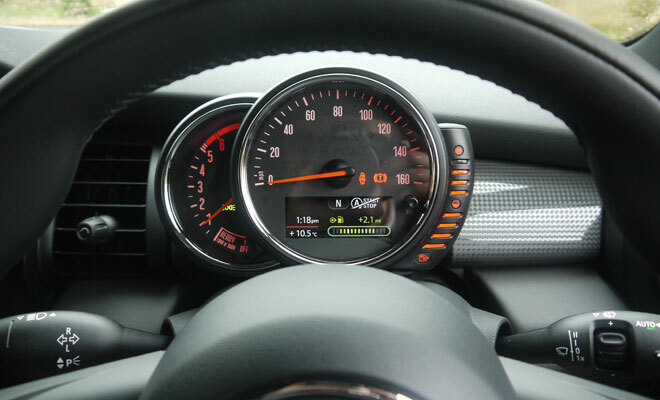 There’s also a Green mode which softens the car’s throttle response and uses the bright little instrument panel screen to give noticeable prompts about excessive speed or which gear you might like to be in. A gauge showing power demand or energy regeneration also appears, together with an encouraging readout of how many extra miles you’ve gained by being careful. The ring of LEDs orbiting the centre console helpfully glows green when in Green mode, though not quite as pointlessly as might first appear. Drive smoothly and the whole ring will glow. But accelerate too fiercely and colour will drain from the top of the ring to the bottom, providing a big, corner-of-the-eye reminder of when you might be wasting fuel. Speed up beyond 56mph and the lights will start to go out even at a steady speed, reminding you that velocity is the enemy of economy. 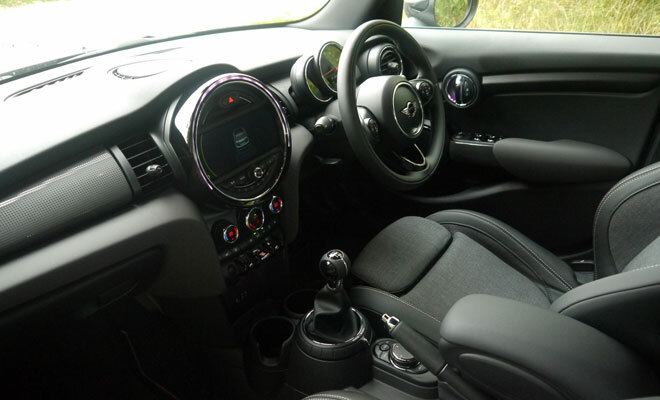 Happily, the six-speed gearbox in this particular Mini felt more finely honed than the rubbery example I tried in a new three-door Cooper in the Spring. In the five-door Cooper D, it felt easy to whip the lever from slot to slot with confidence. The 1.5-litre three-cylinder engine makes an array of surprisingly sporty noises for a diesel, from a bass hum to a throaty growl, while summoning up 116 horsepower and a stalwart 270Nm of torque. With manual gears the five-door Cooper D will gather up 62mph in a fleet 9.4 seconds, and yet has passed its consumption exams with distinction, earning scores of 78.5mpg and 97g/km. You’ll have to drive very carefully indeed to achieve anything like the official economy, however. I managed about 50mpg. Model for model, the five-door costs £600 more than the three-door Mini. Equipment levels are identical at a particular trim level, and options cost no extra. The five-door range starts at £14,350 for the entry-level Mini One. 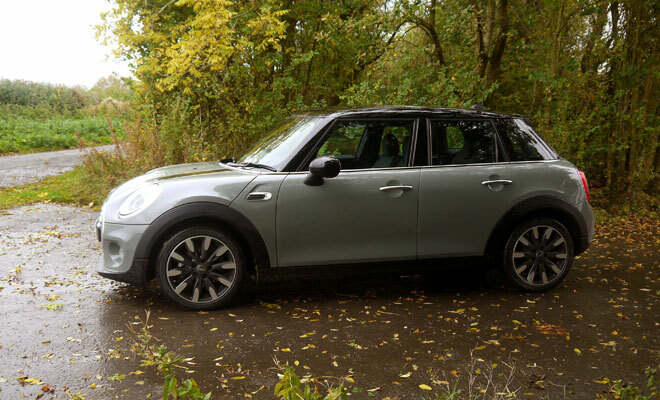 The Cooper D I tested is expected to be the best seller, with a base price of £17,050. 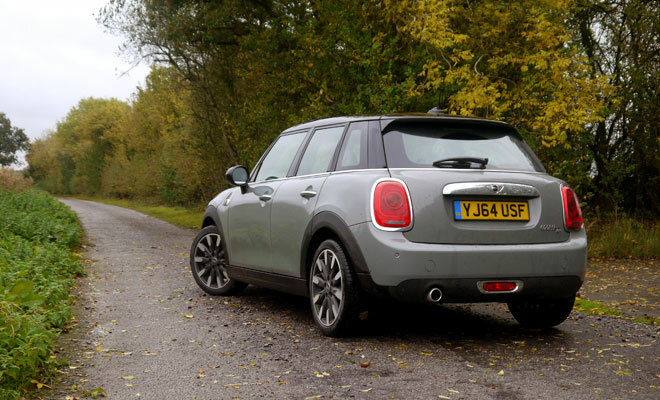 On balance, the five-door Mini manages to provide added practicality while maintaining most of the attributes that have made the three-door Mini hatchback such a perennial success. While not as cute or neat as the smaller car on the outside, the five-door edition feels markedly better on the inside – with more space for legs and luggage as well as improved ride comfort. If you’ve always wanted a Mini but been put off by its cramped and uncompromising package, this could be the car you’ve been waiting for.